The MCP1630 is a high-speed Pulse Width Modulator (PWM) used to develop intelligent power systems. When used with a microcontroller, the MCP1630 will control the power system duty cycle to provide output voltage or current regulation. 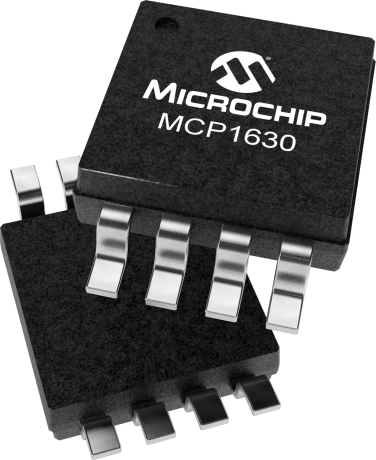 The MCP1630 inputs are designed to be easily attached to the I/O of a microcontroller, which supplies the reference and oscillator to the MCP1630, to generate a flexible and adaptable power system. The MCP1630 Boost Mode LED Driver Demo Board is a step-up, switch-mode, dc-dc converter used for power LED applications. The demo board provides a 350 mA or 700 mA constant current source with a jumper selection. The input operating voltage range is 9VDC – 16VDC and the board can supply up to 30W to a string of power LEDs. The MCP1630V Bi-directional 4 Cell Li-Ion Charger Reference Design demonstrates the use of a bidirectional buck-boost converter used to charge multiple series cell Li-Ion batteries with the presence of an input source (boost) and provide a regulated output voltage when the input source is removed (buck). The board also serves as a platform to evaluate the MCP1630V device. Low Cost NiMH Battery Charger board preprogrammed to charge 3 NiMH cells. Charge profile and number of batteries can be changed with firmware. The design uses the MCP1630 High-Speed Analog PWM combined with the PIC microcontroller. Charge current is initially set for 1.35A fast charge.